Q: What do feather boas, cookies, and paper shredders have in common? A: They are all ingredients that have the potential to help your undergraduate students understand a variety of mathematical concepts. 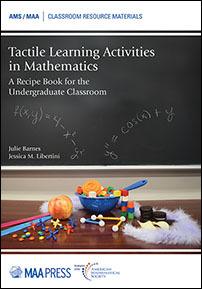 In this book, 43 faculty from a wide range of institutional settings share a total of 64 hands-on activities that allow students to physically engage with mathematical ideas ranging from the basics of precalculus to special topics appropriate for upper-level courses. Each learning activity is presented in an easy-to-read recipe format that includes a list of supplies; a narrative briefly describing the reasons, logistics, and helpful hints for running the activity; and a page that can be used as a handout in class. Purchase of the book also includes access to electronic printable versions of the handouts. With so many activities, it might be hard to decide where to start. For that reason, there are four indices to help the reader navigate this book: a concept index, a course index, an author index, and a main ingredient index. In addition to providing activities for precalculus, calculus, commonly required mathematics courses for majors, and more specialized upper-level electives, there is also a section describing how to modify many of the activities to fit into a liberal arts mathematics class. Whether you are new to using hands-on activities in class or are more experienced, the authors hope that this book will encourage and inspire you to explore the possibilities of using more hands-on activities in your classes. Undergraduate students and teachers interested in introducing active pedagogy.